Since childhood we have been taught about the Revolutionary War battles of Bunker Hill and Yorktown but the Battle of Piqua (also called the Battle of Peckuwe) may have slipped our educators notice. It was the largest military engagement of the Revolutionary War west of the Allegheny Mountains and would greatly influence a 12 year old boy named Tecumseh. Recreation of Shawnee hunting shelters displayed at the Fair at New Boston. The Shawnee had settled near the Mad River in 1754. They were known as fierce warriors, aggressive and proud. This settlement was the combination of 2 Shawnee towns Peckuwe and Kispoko, but altogether these villages were known as Piqua. In time this community expanded with over 50 well built log homes surrounded by 800 acres of corn. Piqua spread out even larger with the arrival of Mingo, Wyandot and Delaware tribes until the village supported over 4000. The British built a triangular stockade as well as making improvements in other village fortifications. With this massive food base and British support, war parties were free to attack American forts and settlements in Kentucky. In June of 1780 a combined Shawnee and British army attacked and took possession of Fort Liberty and Martins Station and took scores of prisoners. It was the mission of Colonel George Rodgers Clark to strike back at the Shawnee to end their constant threat to American settlers who were migrating into the area. Colonel Clark along with Colonels Logan and Lynn mobilized both American regulars and Kentucky Militia. On July 31 over 1000 men arrived at the mouth of the Licking River in Kentucky. Within the militias ranks were 2 men who would later become American heroes: Daniel Boone and Simon Kenton. Colonel Clark’s plan was to move across the Ohio river and secure a supply fortification. Once in place the Militia would then move north into the Ohio Country, destroying the Shawnee raider's supply bases in Chillicothe and Piqua. Step one was completed with the construction of a blockhouse on what is today the site of Riverfront Stadium in Cincinnati. It is believed that Daniel Boone was one of the men left behind to protect the supplies. Simon Kenton would continued on as a scout for Colonel Clark. The Kentuckians reached Chillicothe on August 7 and finding it abandoned, went about the task of destroying everything possible. During the night a massive rain storm came up, just as their scouts were reporting in that the Shawnee were preparing to stand and fight at Piqua. Clark ordered his troops to advance through the heavy down pour. Upon reaching the Mad River, Clark divided his forces into 3 divisions. Colonel Logan moved his men along the river to prevent the Shawnee from escaping to the east. Colonel Clark crossed the river with the regulars and artillery, driving through the center towards the British stockade. Colonel Lynn moved against the left under heavy fire. The stockade was the last defensive position to fall and continued to fight until Clark’s artillery was brought to the line. The Indians fled the battle field to the east. Colonel Logan and his 400 calvary were never able to find a way across the river due to high cliffs and swamps. This enabled the retreating Indians to escape. The Militia completely burned the corn fields, and destroyed the settlement before returning home. After the battle, the Shawnee moved northward and would settle in what is today Piqua, Ohio, about a 45 minute drive up Interstate 75. Today the location of the Shawnee Village Piqua and battlefield is being preserved and is located just outside the George Rogers Clark Park. A monument of Colonel Clark overlooks the battle site honoring both sides of this important conflict. The Davidson Interpretive Center is located at the battle site and offers displays and exhibits concerning both the battle and Shawnee village life. The center is open Monday - Friday. 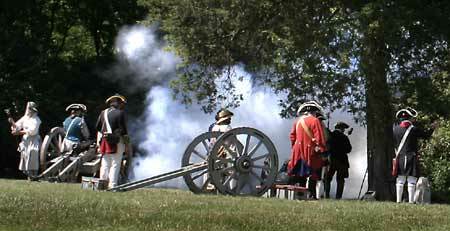 Every Labor Day weekend, the Fair at New Boston is held on the grounds overlooking the site of the Battle of Piqua. Part of this recreation of New Boston include re-enactments of a portion of that battle, complete with cannons and attacking Indians. Born in 1752 he would have eight brothers and sisters. His younger brother William would team up with Meredith Lewis to become the famous explorers Lewis and Clark. Clark came into adulthood just before the Revolutionary War and with enthusiasm took part in that war. His stature was tall for the times and through his education and his very presents he rose in rank during the war. Most of his military service was was with the Kentucky Militia. In 1778 Clark and his men captured Kaskaskia and in 1779 they destroyed Vincennes. These 2 victories crippled the British in the Northwest Territory and Colonel Clark was hailed as the Conqueror of the Old Northwest. George Rogers Clark had a deep influence in the making of what would become Ohio. He died February 13, 1818 and is buried in the Cave Hill Cemetery near Louisville, Kentucky. Early on in his life his father was killed by an American frontiersman. Tecumseh was adopted by Chief Blackfish who took him into his family training him for the role of a chief. Tecumseh would travel between Chillicothe and Piqua learning tribal history, as well as an education of personal conduct. Tecumseh became a feared warrior. He would be present at the great Indian victory over General St. Clair at the battle on the Wabash River. Tecumseh would also be present at the signing of the Greenville Treaty even though he would never accept it. He worked tirelessly at uniting the tribes in the fight against American and the protection of his homeland. Tecumseh joined with the British during the War of 1812 and was given the rank of Brigadier General. On October 5, 1813 the 45 year old Shawnee Chief was killed near Detroit during the battle of the Thames. His men took his body and buried it in a secret location no white man would ever know. From streets named after him to outdoor dramas Tecumseh is proudly remembered in Ohio as a fierce warrior, brave and proud.